After buying several second hand costumes through the internet, I noticed that I am roughly 10 cm/4 inches taller compared to most dancers. How do I notice? Because most of the time, the skirt is too short. I hate short skirts, because it breaks the body line and it looks like I’ve outgrown my costume lengthwise. One of the reasons for me to start making my own clothes was because it was nearly impossible to find pants that were long enough. A while back I bought a gorgeous second hand costume that I suspect is a Hannan. No label though, so I can’t be sure. The beadwork is superb, very pretty with holographic sequins and seed beads. And it also happens to be too short. Hm. I’ve worn this costume before but it never quite felt right. This summer I am overhauling my costume stash and fixing all the things that need to be fixed and this costume was high on my list. As an extra challenge, I try to use the materials I already own, as my stash is overflowing. 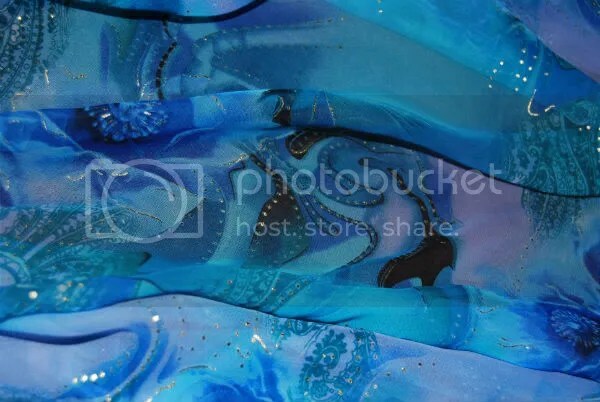 In May I turned two blue chiffon veils into a circle skirt. I needed a blue circle skirt for my student recital and the fabric was a bit too heavy for intensive veil work anyway. The left over scraps were turned into one long piece of fabric, app. 12,5 cm/5 inches wide. I didn’t measure the length but it was slightly longer than the edge of the skirt. I finished all edges of the fabric strip, then used a long, loose stitch along the top edge of the strip. Pinning the beginning and the end, I started gathering the ruffle and pinning it onto the hem of the skirt. It took a while to get the fabric evenly distributed but it worked. I used my sewing machine to secure the strip to the skirt and I need to hand baste the edge to finish the seam neatly. I started blogging about the Minty Fresh costume in January 2014. An updated drawing of the design was added in April 2015. I sort of finished the costume and wore it for a performance in August 2015 when I was halfway through my pregnancy and it has been quiet ever since. But that doesn’t mean nothing happened! This year I am really big on drum solo’s, probably because I’m working on a lot of dance technique things and drum solo’s are great for using and practising isolations. The end of the year recital from Roos Belinfante came up and I wanted to wear something nice and summery. Then I remembered the minty fresh costume, that luckily has elastic side straps on the bra and an elastic waist band. It saves a lot of time as it needs less adjusting. In the Original design, I planned on adding beading all around the skirt. Well, that didn’t happen. I’m adding it to my to-do list for this summer, it would be nice to completely finish this costume before moving on to the next project. For extra movement I added beaded swags by buying two long necklaces and pinning them to the skirt. Yes, it is that easy. The drum solo went over well I think. It’s a an improvisation based on a choreography so some things are planned and some things are not. Overall I liked how relaxed the afternoon was and I immensly enjoyed all the performances by both students and my dance friends. Here’s the video of the drum solo so you can see the costume in action. Have a great summer and see you soon! A couple of months ago I started working on a blue/green costume. I covered a Dina bra base, rope beaded the edges and covered the strap. Then life happened: I was the producer/teacher/stage manager/sound engineer for the ‘Arabian Nights’ shows in December, that certainly was a lot of fun. During Christmas I had a personal matter that asked for all of my attention and after New Year I needed to work on promotimg and teaching my weekly classes. All very valid reasons why I didn’t continue working on the minty fresh costume. What also didn’t help is that I cut into one of the backpanels of the skirt by accident and I don’t have more of the blue fabric. 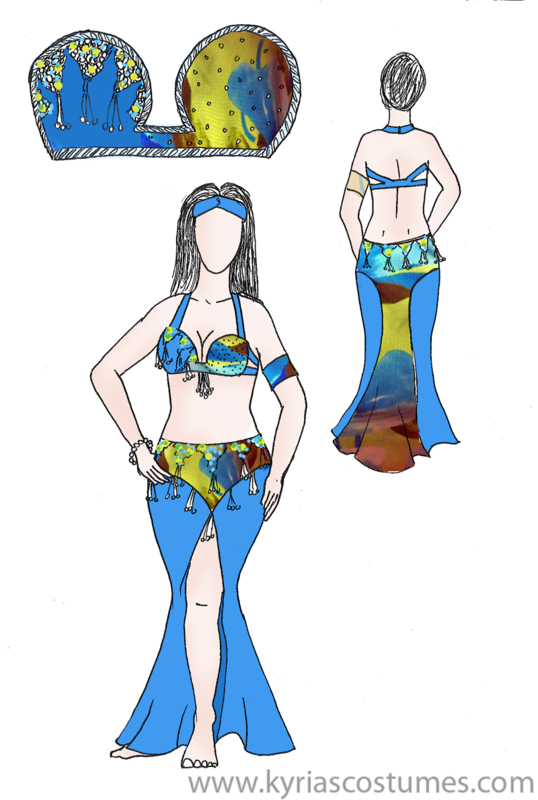 The skirt design needed to be completely redone to make up for that mistake. s the updated design. As you can see, there’s a bit of an hourglass line going on in the skirt that should work wonders. I find it hard to continue and finish costume projects that are put on hold for some time. A good example is the green velvet costume that I started in 2007 and finished in 2011. An even better example is my to-do box that contains costumes that I will probably never finish. But! Finishing a project is very important for my state of mind. Unfinished projects are like skelletons in my closet, they are in the back of my head taking up space that I rather use for new projects. with that in mind, I cut the new patter pieces and made the matching skirt. Sure, it isn’t a complete costume yet, but all it needs is some chunky beading and a bit of fringe to take it to the next level. And with that in mind, I am putting it back into the to-do box. I dare you to post about one of your unfinnished products on your blog or facebook. Tag me and we can act as an ‘unfinished project support team’ for each other. I am still working on the minty fresh costume, albeit slowely. I recently covered the shoulder straps for the bra. As I don’t want to add beading to the bra straps, I wanted no visible stitches on the outside of the straps. Usually I cover straps by wrapping them in the desired fabric, then stitching along the sides of the strap. This time I used lycra, which made it easier. I first created a tube that fits perfectly around the original bra strap. Turn the tube inside out by using a big safetypin, push the pin through the center to flip it inside out. 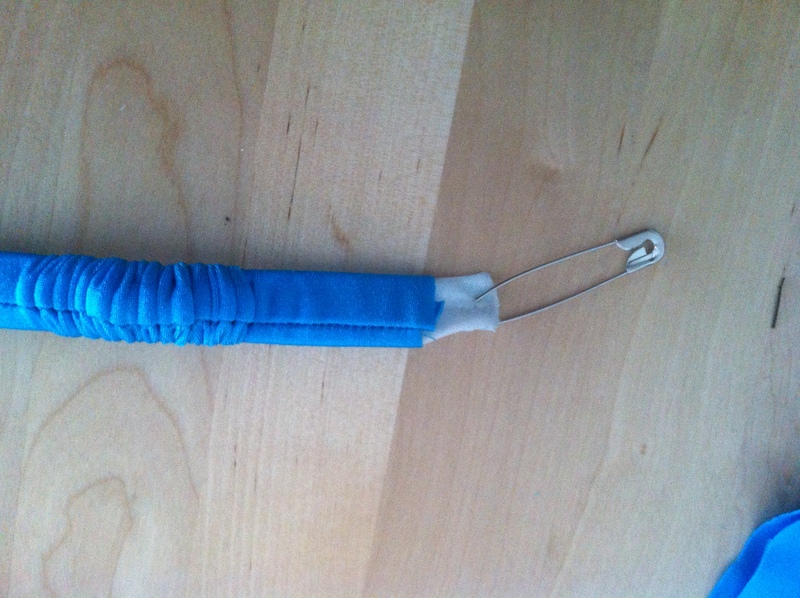 I then used the safetypin to pull the white strap through the blue casing. It took a bit of wiggling aorund to get this right but it worked. I then smoothed the outer casing until the seam was neatly on the inside of the strap and there were no more wrinkles. I then used a straight stitch to keep the casing in place: one time straight acros the bottom (with a piece of white still visible). On the top, I folded the top edge of the casing over the edge and stitched it in place. Left is an exmaple of the bottom that will be attached to the bra and hidden by the lining of the bra. 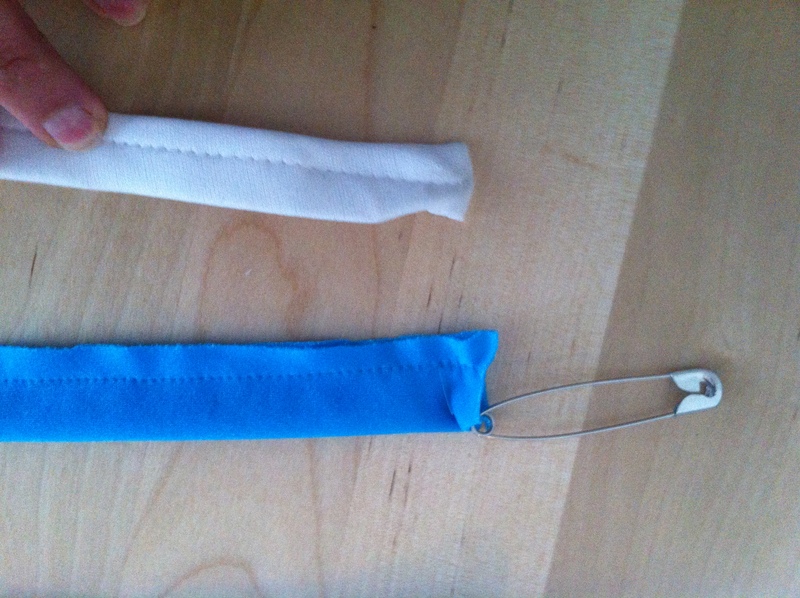 On the right is the example of what the top of the strap looks like. Haven’t had tme to actually attach these to the bra, but I will get there soon! A bit of a bummer was that I cut up one of my skirt pieces by accident to make the casing for the straps and I now have to rethink my skirt design. More about that later. I posted a couple of pictures on buz and facebook but I felt nostalgic and want to write more about the proces on LJ. Hi, my name is Kyria and I’m a costuming addict. It’s been almost a year since my last costuming project. And the last projects didn’t count, as they were small repairs like lining a coin bra and fixing a beaded applique. I made a red satin dress for a bellydance-burlesque performance in december 2013 but that wasn’t really bellydance. Time for a new costume! I did a fabric swap with Bea a while back. She sent me the remnants of turquoize lycra that she used for beledi dresses. I sent her red lycra I think, can’t remember exactly. Bea included the leftover beads and I neatly put all of this away in my fabric stash. That must have been two years ago. about a year ago I bought two Dina style bra bases through facebook (can’t remember the seller) and once again, put it neatly in my stash. Now that I am rekindling my activity in the dance community I want to wear something new and I am starting with this. First time working with this type of bra base. Observations: it holds it shape very well yet is easy to penetrate with a needle (something I worried about). I give it a thumbs up and intend to buy more bra bases. I took the bra straps off to cover the base. The straps are very basic. I’ll keep the neck straps but I’m not sure about the ribcage straps. 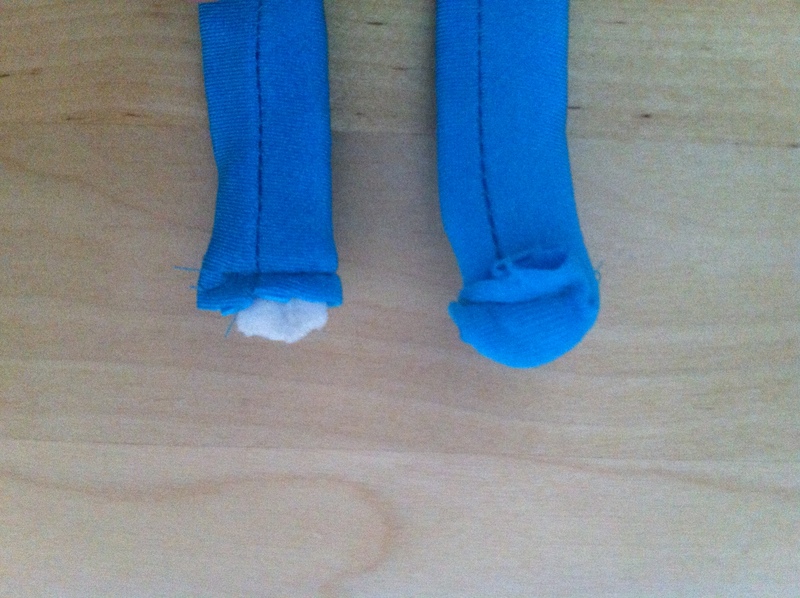 They are made of covered elastic and after two years, they are probably losing elasticity. It would be a shame if the straps would not give sufficient support once I am finished. The second epiphany was that Bea sent me large seed beads with large holes. This is awesome. I’ve worked with Gutermann seed beads before and even the larger beads have TINY holes, causing needles to get stuck and such. Big seed beads means that rope beading the edge takes less time, one more reason to break out a bottle of red wine and celebrate. The contrast fabric is printed lycra from my local fabric market. 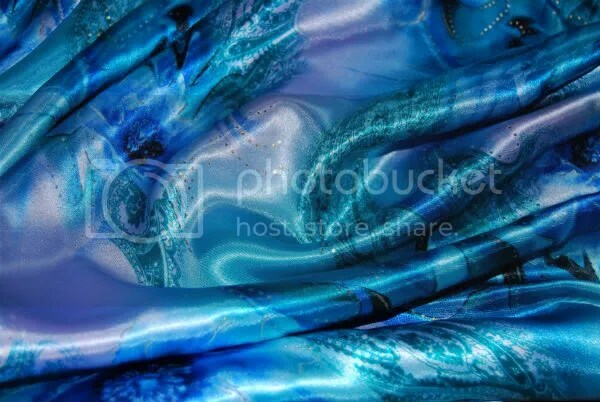 I got a lot of this with the idea that it could be used for troupe costuming which I totally should not do. For my december production, I bought 60 meters of a lighter turquoize chiffon with a subtle paillette and a lurex thread in the fabric. It is gorgeous and doesn’t match the lycra. Go figure. 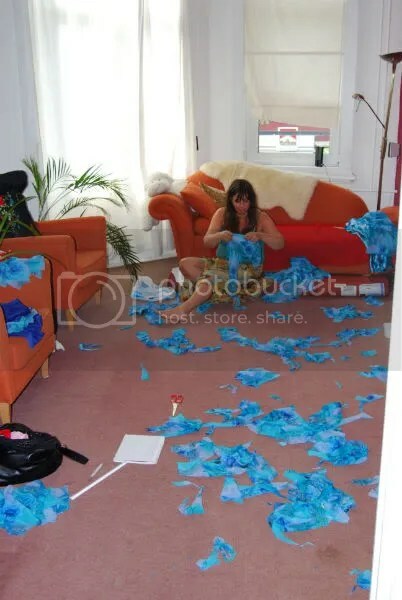 And this is Shaia, trying to find eough fabric to make the last pairs of chiffon sleeves. This is what my livingroom looked like on Wednesday, I’m grateful to the person who invented the vacuum cleaner. Roos and her daughter come over. We cut the remaining fabric, add waistbands to the skirts and make two pairs of pants and manage to cut all of the skirts. This took another five hours. We learn that we don’t have enough fabric to make the last two pairs of pants, and Ros and I decide to go to the fabric market that Saturday for the remaining satin + extra fabric for the jackets. The jacket are made by Kandila, a friend of Roos. We are all very happy that she agreed to do this for us: we are of course paying her fher work. The man who sold us the fabric tells us that he is all sold out. Argh! We find another fabric in similar colors but a different pattern for the pants but are bummed that we couldn’t get the original fabric. Buying the additional fabric for the jackets is easy. It’s busy at Costuming HQ: Shaia, Roos and Gunesh arrive around 11.00. Gunesh brought her sewing machine, as we will need to do a lot of hemming today. We hem and finish our own pants/skirts and we all mark our own skirts/pants by sewing a scrap of fabric to the inside. Roos a leftover from the pink lycra costume from 2010, Gunesh a scrap from the green velvet costume 2011, and Shaia a piece of fabric from the pink/wite polkadot dress from 2009. We manage to cut six sets of sleeves from chiffon scraps. This sewing marathon lasts seven hours. unday 15th, 12.00: arrive in Bussum or the show, on time for the run-trough of the show. Hadyr ad I will perform our Turkish duet, and the troupe will perform the Muwashahat. Will we finish our costumes in time? Will the man at the fabric market have matching chiffon or do we have to make do without? And how about the jackets, will they be ready tomorrow? Stay tuned for the next episode of Costuming marathon: Muwashahat! I got home aroun 23.30 on Saturday and decided it was the perfect time to start working on the tropical costume. I sat down with tea, decent light and a movie (Casino was on) and started working. I added the beaded strands to the skirt/bra, have to tack them into place. This is a safety pin fix so I can easily change the strands if I want to. Then added sew on acrylic jewels and hotfix stones. I know it was time to stop working when at 3 a.m. I give to you: the tropical costume plus more bling.